Alexis Jeffers, Deputy Premier of Nevis views a section of the new Newcastle Police Station under construction. 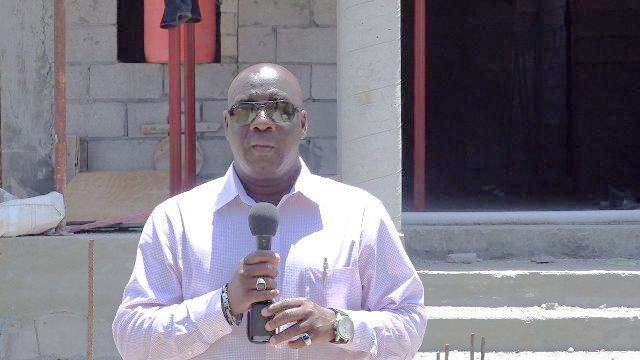 CHARLESTOWN, Nevis — There has been steady progress and good workmanship in the construction of the Newcastle Police Station according to Hon. Alexis Jeffers, Deputy Premier of Nevis and Area Representative for the St. James Parish. Jeffers, who is in charge of spearheading the project on behalf of the Nevis Island Administration (NIA), visited the site on Aug. 22. The Cabinet visited the site four months ago and there has been steady progress since then. Construction of the new $3.7million Newcastle Police Station began in January with NIA funding. The 15,312 square-foot project is expected to be completed by July 2019. The deputy premier said he hoped that the federal government would assist with more funding for the project, because national security falls under its purview, even though the NIA has already provided some funds for the project. On completion the two-storey multi-purpose building will house male and female officers from the Royal St. Christopher and Nevis Police Force and the St. Kitts and Nevis Fire and Rescue Services. It will also be equipped with the necessary amenities to support the officers who will be stationed there. The new police station will replace a steel frame building which housed the Newcastle Police Station. In 2016, it was considered unfit for humans to live and work in was condemned and subsequently demolished. Police officers stationed there were redeployed temporarily to a rented building adjacent to the Vance W. Amory International Airport, along the Island’s Main Road. Jeffers said the NIA is providing the necessary infrastructure for the police to ensure safety and security is maintained on the island. In that regard, the station forms part of the administration’s overall strategy. The minister used the opportunity to commend Jasper Stapleton, the project’s general contractor; subcontractors, Lawrence Brandy for the electrical and Theo Wallace for the plumbing. Steadroy Pemberton is the Project Manager.